Travelpotato.com | Holidays in Dubai Best of Europe!! Curated especially for you!! Arrival at Dubai Airport. Transfer to hotel. Night stay at hotel. 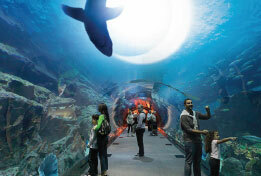 After breakfast Transfer to Dubai Aquarium & Underwater Zoo with Dubai Mall. Come back to hotel freshen up. 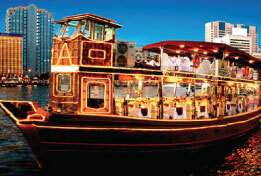 Evening transfer for Dhow Cruise with Dinner. Night stay at hotel. After breakfast transfer to Half Day City tour & Burj Khalifa 124th Floor drop off. Afternoon come back to hotel freshen up & transfer for desert Safari with BBQ Dinner & Belly Dance. Night stay at hotel. After breakfast check out from hotel & transfer to Airport for departure. 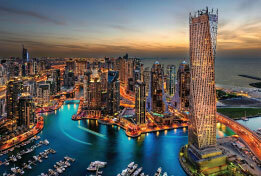 The best time to visit Dubai is during the winter months, from November to April. January and February see heavy tourist traffic because of the Dubai Shopping Festival, which makes the city come alive. Heres a monthly breakup of Dubais climatic conditions so you can plan when to go: November to March : Dubai winters are from November to April and this is the best time to visit Dubai. The weather is pleasant and suited for all kinds of outdoor activities. Whats more, the much loved Dubai Shopping Festival is held during Jaunary-February and that is when you will see Dubai actually crowded. Since this is the peak season, hotel rates and airfares tend to go really high. Book well in advance to get the best rates possible and avoid any inconvenience. April to October : The temperatures begin to rise by April and May and during peak summers, even start hitting the late forties. Summer months in Dubai are really, really hot and humid, making it almost impossible to explore the outdoors. However, all malls/stores are air-conditioned and you can indulge in as much retail therapy as you would like. Desert safari with BBQ dinner and belly dance. E-Visa & Ok to board.